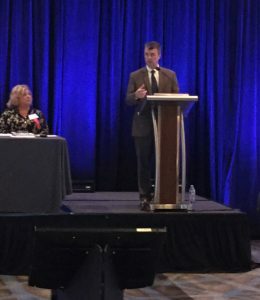 BIRMINGHAM – Alabama Attorney General Steve Marshall addressed attendees during the Association’s Annual Medical Ethics seminar on Friday, Nov. 17, at the Hyatt Regency Hotel in Birmingham and helped kick off one of the largest weekends of educational offerings the Association has hosted since 2014. The weekend began on Friday, Nov. 17, with Ensuring Quality in the Collaborative Practice and Medical Ethics courses. This was the first time an attorney general has spoken to the participants. By Saturday, Nov. 18, the room was filled with more than 430 participants for the final Prescribing of Controlled Drugs and Controversies of Pharmacology Prescribing course of 2017. The Association’s opioid prescribing courses began in 2009 and is offered at least three times annually. By the end of 2017, more than 5,000 participants – from physicians, physician assistants and nurse practitioners – had taken the course. The Prescribing course will return in 2018 on March 17-18, August 3-5 and November 17-18. More information will be available at a later date.